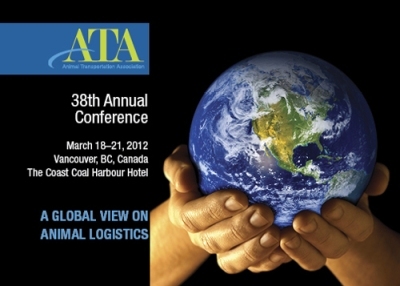 From the 18th to the 21st of March 2012, the 38th annual meeting of the Animal Transportation Association was held in Vancouver, Canada. This international organisation sees the major transport companies engaged in the promotion of live animals good governance and management practices, moved for commercial, protectionist, sports and tourism reasons. During the meeting, speakers presented research projects and new operational solutions aiming to improve the welfare of pets, laboratory animals and productive livestock. Particular attention focused on the commercial trade of live animals, on a global scale, and the potential opportunities rising from the employment of the most advanced scientific and technological applications developed in the field. Experts of the G. Caporale Institute contributed to the meeting by presenting the results of a research project financed by the Ministry of Health, aiming to study the welfare of sheep during long distance transportation and the effects of the stopovers required by Community legislation. The meeting sessions were animated by the interventions of speakers representing major airlines and international exporters of live animals as well as by the scientific contributions of many researchers involved in the study of animal transport worldwide.